Does just the word fill you with terror? Or am I the only one l who heard that lard was evil and full of stuff that would kill me young? Food is so contradictory. We try and eat fresh and clean food as much as possible. And then wonder what that means! I found a cookbook recently that details making pie crust. Including crust made with a variety of fats. Lard is used in making savory crusts, and my history has 2 well known savory hand pies: the empanada (my stepmother is from Argentina) and the Cornish pasty (my great grandparents emigrated from Cornwall to the upper peninsula of Michigan, where my great grandfather was captain of a copper mine in the town of Republic). And Homer and I just straight up love a pie of any kind: quiche, fruit, pumpkin, vegetables, meat...it's all good. With our pigs living on pasture the meat is clean tasting. After reading through the cookbook we started dreaming of pies with lard crust. An empanada is spiced a little differently than a pasty. Quite similar ingredients until the divergence occurs with olives, raisins and garlic in the empanada, thyme and rosemary in the pasty. The crust is the question. 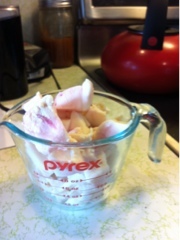 Modern recipes call for good quality lard. We are pretty certain we have that, from our pigs. The process to get lard is a separation over low heat, until there is liquid that can be poured off. That, kept in the fridge for a few weeks maximum, is the foundation of what is reported to be the best crust ever. After the lard was removed from the cast iron skillet, burgers went in. 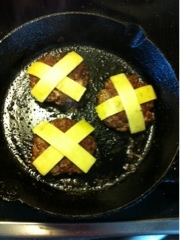 Rated triple X, as this is all the stuff we are not supposed to eat. Cheese (grass fed cheddar), beef (grass fed here) and lard (grass fed here). It was, without question, the most delicious and satisfying burger I have ever eaten. The dog did not get a speck from my burger. Homer makes 2 for him and usually shares a bit with her, but this was not a give to the dog sort of meal. A savory pie will happen this week, with a lard crust. Promise of a crisp, not soggy crust even with and egg filling tempts that, but more investigation is needed before we get started.